This paper makes reference to a developed version of the notion of networks of remediation outlined by Jay David Bolter and Richard Grusin in the book Remediation. As an example of networks of remediation I chose the case of comic strip character Popeye the Sailor Man because it represents a case where the process of remediation and translation across old and new media is being applied through many decades as repurposing, borrowing and adaptation of originally paper-based content. The case of Popeye is complex and it is not a linear replacement of a previous medium format with a new medium but the meaning is made with reference to chains of remediation. 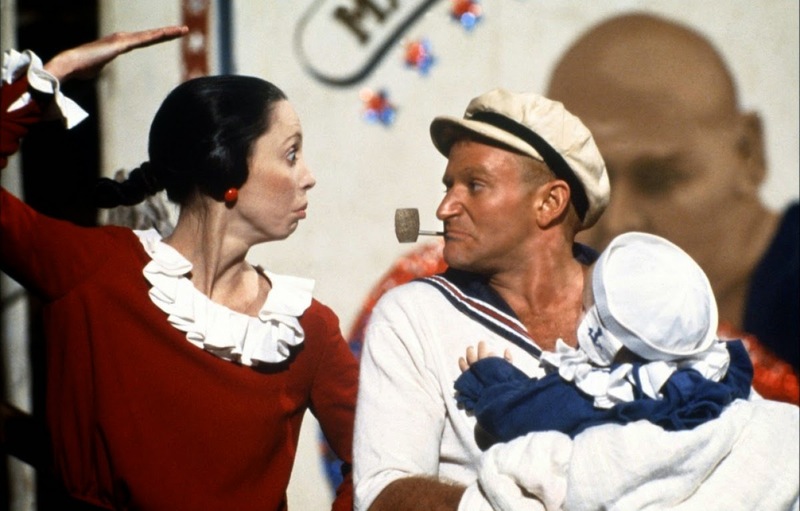 In particular the comparison will be between the content of comic strip Thimble Theatre and the live action film musical Popeye, with some references to the various groups of televised animated series. Fictional character Popeye was created and drawn by E. C. Segar for his comic strip series Thimble Theatre in 1929. 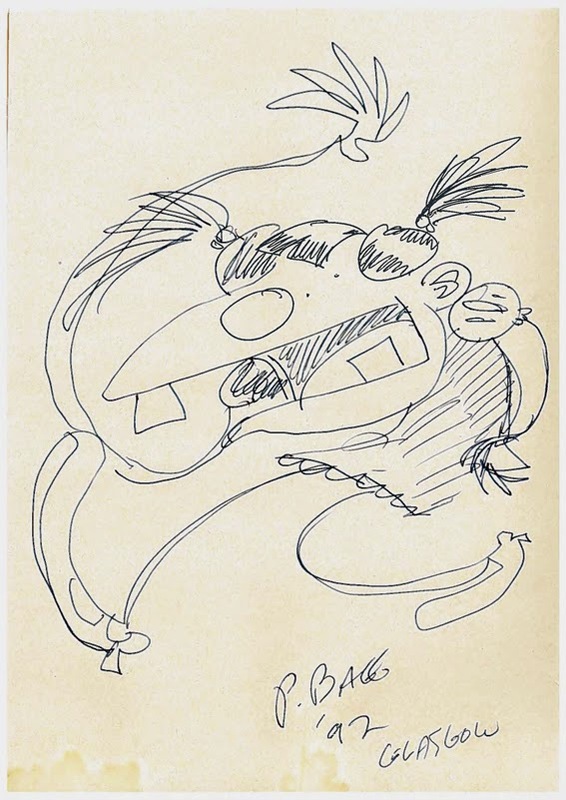 E. C. Segar loved puns as attested through his homophonic signature Ci-gar accompanied by an image of a smoking cigar. 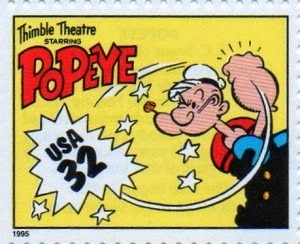 Part of the content of comic strip Thimble Theatre together with its successful character Popeye immediately spread and further developed into other media formats. The most famous remediation of comic strip The Thimble Theatre is the televised animated cartoon series Popeye the Sailor Man featuring simplified and repetitive stories with fewer characters in episodes lasting 8 minutes. The visual part of the animated cartoons is also revealing of changes throughout time in what is to be considered a social practice no longer acceptable by the media in the English speaking countries. 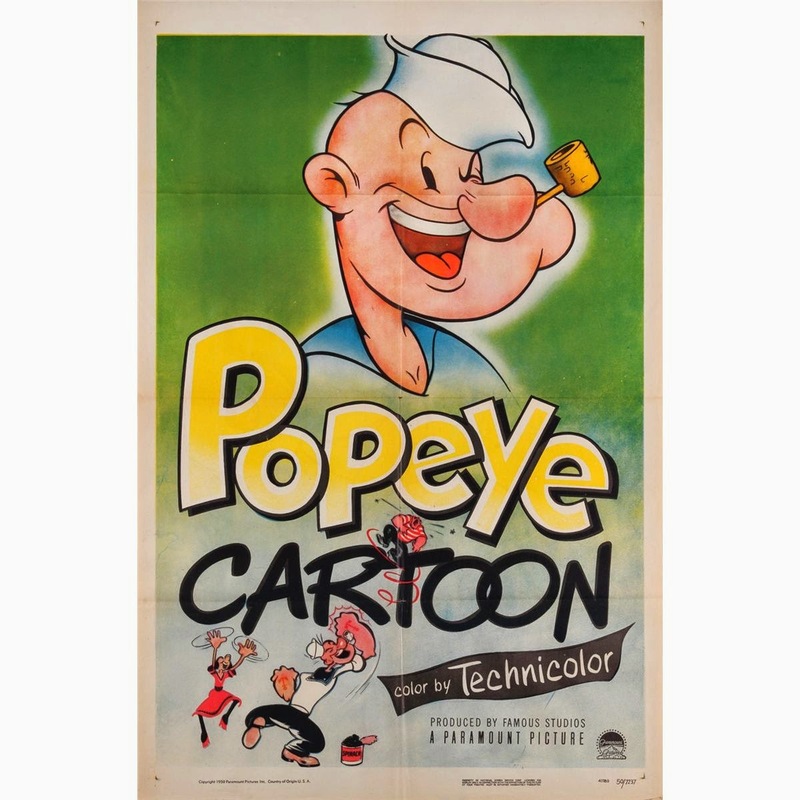 The animated cartoon Poopdeck Pappy aired in 1951 presents some racist stereotypes, which were absent in the original comic strip story and will completely disappear in the updated version of the 1937 comic strip story adapted to a musical action film in 1980. The 1952 animated version of Poopdeck Pappy could be judged as racist because the original goon protecting Poopdeck Pappy is replaced by funny dark skinned natives who worship King Pappy. They are represented in a satiric and distorted way: they are cannibals trying to cook Popeye, they are called savages, and they express themselves with non-linguistic sounds like oogla boogla ooga booga. All young women are wearing grass skirts and they dance for Poopdeck Pappy treating him like a superior being. At the end Poopdeck Pappy frees kidnapped Popeye, stacks the black men on spears and hangs a sign on them that says cheaper by the dozen which likens the black men of the story to steaks for sale. A less known remediated product is the 15 minutes radio programme Popeye introduced by a repetitive song refrain I’m Popeye the Sailor Man (twice), I yam what I yam ‘cause I yam what I yam. Both the expression I yam what I yam and the complete name Popeye the Sailor Man that compose most part of the introductory refrain had already appeared as titles of two theatrical animated shorts. The radio program the Gang at the Zoo (1930) is a dialogue characterized by the presence of several synonyms of amazed: I am surprised, I am flabbergasted, and the expression blow me down so distinctive of the character to become the title for another theatrical animated cartoon short (1933). In this radio program Popeye eats four bowls of cereal to enhance his muscle strength, instead of reaching out for the usual can of spinach. The language is unmistakably Popeye’s idiolect previously portrayed through the written mode of the language inside comic strips speech bubbles. In the audio format it is not the spelling but rather his pronunciation that reveals that it is Popeye. An example is a devoiced velar \k\ allophone, either added to some words as in mouskey or musckles or used as substitute of dental /t/ in final position as in \ˈeləfnk\for elephant and \ˈpēnəks\ for peanuts and some mispronunciations as \pˈkülər\ for peculiar that are not found in the original comic strips. He uses reduced forms typical of standard spontaneous spoken dialogue, as attested by the omission of the voiced fricative \th\ in \əm\ in uttering the locution feed them. This pattern is then erroneously applied to the locution with others resulting in \ˈwitˈətərs\. He then uses the non-standard auxiliary form ain’t for both is not and haven’t, colloquialism as me think, and ungrammatical inflectional morphology as in: has yous, I says, and they is. A videogame spin off followed the film version and it was released by Sony for Nintendo in 1982. As every videogame the background story is borrowed from the film version and the new medium environment offers the user the possibility to perform as Popeye in the double task to capturing Olive’s hearts or musical notes and at the same time avoid his antagonist Brutus. A can of spinach enhances the avatar strength but grabbing it is made difficult by the wicked Sea. Popeye is characterized by his physical and verbal distinctive features and his honest behaviour despite his love for fighting. The visual mode allows the viewer to recognize him through his bulgy forearms with a tattoo, a very big chin and a lazy eye. His outfit is the suit of a sailor and the last distinctive trait is his corncob pipe that he does not smoke but keep it in his mouth anyway. The verbal mode has many variants at the phonological, morphological, syntactical levels and many contradictions at the semantic level. His idiolect is a mumbled, mispronounced, colloquial language with some catch phrases such as: blow me down. The most salient features that represent social actors in the 1980 live action musical film version are their distinctive physical appearance as well as their verbal and kinetic behaviour. In the case of Popeye it is his bulgy forearms, his squinty eye, his corncob pipe, his sailor suit, and the scripted mispronounced colloquial English full of grammatical errors. Popeye’s spoken mode of the language follows a pattern of elisions as well as substitutions of phonemes and additions of extra grammatical sounds. Popeye’s creative language follows a pattern of substitution, addition and elision at the morphological and phonological level. He then uses colloquialisms and makes some grammar mistakes. Modified words are created through morphological substitutions or modifications or by adding extra sounds and by dropping others. There are morphological modifications of affixes. Colloquialisms are used in abundance as for example the random elision of auxiliaries and the use of non-standard contraction ain’t for the whole declension of the verb to be: am, is, are, not; the pronoun me is given an extensive syntactic and semantic coverage that includes the adjective my so that he may say me Olyve. Grammatical errors are morphological as for the use of wrong verbal paradigm, for example: I catched for I caught, or the use of a colloquial incorrect morphological suffix as in I knows for I know. In a complete sentence of a 1929 comic strip, Popeye adds morphological errors to syntactic errors, to mispronunciations so that the grammatical sequence if I'd known this, I'd have stayed ashore. I’m only human becomes If I’da knowed this, I’da stayed ashore. I’m only hooman. This last pattern of substitution is later found in the radio broadcasted spoken conversational turn that says: Well, blow me down, has yous ever seen the likes of such a pecooler \p’kuler\ animal. In a small extract from the film Popeye, a dialogue between Popeye and his dad Poppa, some patterns that are repeated throughout the film emerge. Popeye: Poppa! Pap! Ik's me, yer orphink son! Poppa: I hates snktiment ! I yam disgustipated! Gnats to you! Phooey! In the above quoted conversational exchange between Popeye and his father the word orphink is a morphological blend of orphan and infant pronounced \infink\ because of the substitution of dental \t\ with velar stop \k\. The word disguastipated is again a blend this time between disgusted and constipated. In the same film, always Popeye’s idiolect attest the following linguistic phenomena: addition/insertion, substitution, elision. The elision or omission of auxiliaries in the ungrammatical question - You know what I done? Where the grammatical version is: - Do you know what I have done? The constant use of wrong declensions is exemplified in the sentence - When he catched me and thrung me which contains a substitution of caught with catched and of throng with the throng. The technique of substituting sounds or phonemes and suffixes is particularly productive as it is revealed in the following word variants: inf[i]n[k] for infant; depressi[gan] for depressed; intelligen[sk] for intelligent; phy-sci-kisk instead of physicist. The technique of inserting extra sound or extra phonemes is sometimes used by the same character as it appears in the invented word humili[gr]ation. The scrambled word annualversity is the result of modified morphology of the original noun anniversary. The comic strip has sometimes even more complex variants at the spelling level that go beyond the possibility of phonemic variants. The modified words octIpus and octipussuses are so hard to pronounce that a character in the story comments: -Would it be easier to say octopuses? Popeye’s answers is: I always gets too many syillilables in that word. The word offspring is spelled with many variants: oxprinf, exsprinf and orfspring but the original offspring is never there. In the comic strip the wrong declension is also used as for example in I gived for gave or for given in Popeye’s sentence: Ya gived me yer ship, I ain’t used to havin’gived things to me for the grammatical sentence: You gave me your ship, I am not used to be given things. Some variations are probably attesting a defect in the way Popeye talks. Examples are the substitution of s with x that transforms the verbal form asking in the variant axking where there is a switch of the sound sequence \sk\ with the sequence \ks\. Other common substitutions Popeye’s idiolect are: the substitution of voiceless fricative \θ\ with plosive bilabial \p(h)\ in sumpin’ \sʌmpn\ or for standard \sʌmθɪŋ\ something and with alveolar occlusive \t\ in munts /mənts/ for standard months /mʌnθs/. There are also substitutions where variation appears only at the level of spelling as in sum \sʌm\ which is homophone of the original some \sʌm\. There are of course some elision typical of non-standard spontaneous conversations such as the elision of final alveolar stop \t\ in the adjective just resulting in jus’ \dʒʌs\ and the elision of nasal (ŋ) in \sʌmpn\ for \sʌmθɪŋ\. The substitution of one words with another such as sedimental for sentimental which is also a distortion of the geological term sedimentary. This phenomenon happens both in the film and in the comic strip and it has a reference to some kind of uneducated spoken English that often confuse and mispronounce or misspell Latin-derived words. Most of the animated cartoon shorts series follow the same creative rules by adding extra sounds and by substituting suffixes. Examples are found even in the titles of the animated cartoon series: STUperstition instead of superstition; OUT to P-UNCH instead of out for lunch; insect to injury instead of insult to injury; I don’t Scare instead of I don’t care; immaginIMation instead of imagination, Aminals instead of Animals. A trait of Popeye’s idiolect that is a constant in the his verbal representation across media is the phonemic substitution of the voiceless dental alveolar stop or occlusive \t\ with a voiceless velar stop or occlusive \k\ at the end of a word. The following examples illustrate the variation phenomenon: renk instead of rent in the utterance room for renk; ya knot insulk me poppa instead of do not insult my Papa (or Pappy or Pop). Carmen Maier’s analysis of short videos for marketing purposes that also promote a specific values and social practice is based on the identification of recurring resources and of the process of legitimation among other things. In the case of 84 years old character remediated in many different media a recurrent resource across all media is its counterfactual humor and nonsense. This resource for meaning making is definitely affecting the semantic level of the language as well as all other linguistic resources such as spelling, morphology, syntax, and the phonological levels. Popeye: If I was going to be SweePea’s mother, I should’ve at least let Olive be his father. Or viska versa. Popeye: that’s going to be hard for you to SEE. Popeye: We even got the same pipe, Pap. Grandpa: You idiot, you can’t inherit a pipe. Other recurring resources and borrowed content are: the can of spinach which is central part of every story in the animated series. 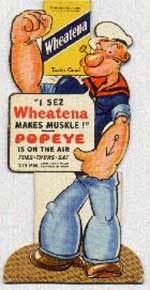 In the radio series the can of spinach was substituted by the sponsor’s product: Wheatena breakfast cereal. In the film the can of spinach undergoes a verbal legitimation when Popeye’s father invites pushes Popeye to eat his spinach to win the fight against Bluto. It undergoes a visual legitimation because a can of spinach is part of Popeye’s father’s buried treasure. A kinetic legitimation is present across media because Popeye acquires his super strength as direct effect of eating spinach. Bluto’s actions delegitimize him: he is a kidnapper and he acts out of greed. Evidence of his wrong doing comes from both kinetic and visual modalities. Olive Oyl verbally delegitimizes Bluto when she claims she would not be engaged again with him, not for the third time. Her role is that of evaluator of human behaviour and she often telling men what they are as a result of what they do. Popeye is legitimized by acclamation on the part of the people of the village in the live action film because he hits the tax-man, he defeats Bluto and he gets rid of the giant Octopus who was trying to eat Olive. In the live action film the finding of Popeye’s father and the presence of a Giant octopus are part of borrowed content. Both storylines are very much simplified from their original version of the three stories of the thimble theatre 1936: Popeye and the Jeep, Popeye and the Mystery Melody, and Popeye's Search for His Poppa. The story and the characters are legitimized or de-legitimized through their actions and their behaviour according to the social values of the time. A handful of Popeye cartoons during the war years were racially offensive towards the Japanese. The delegitimation is verbal as, for instance, in cartoons where Japanese are referred to as jap-pansies and it is also visual because they were portrayed with vicious, buck-toothed faces. Japanese soldiers are beaten up in a now banned racist World War II Popeye cartoon called Seein’ Red, White‘n Blue. Parts of Popeye cartoons are now edited out because of their rather offensive representation of African-Americans. On the other hand some early Popeye cartoons are maybe surprisingly against violence toward animals as it can be seen in 1935 Be Kind to Animals and other similar cartoons of the same years. A comic strip character can live 85 years and still be in good shape when the meaning making of its stories is constantly re-adjusted to the current social behaviour and when the re-contextualization across media can be effective. Popeye was not a good videogame maybe because the verbal language disappears in videogames and I would say that maybe it is this mode that offered the funniest real element in a surreal world. Today the character appears to appeal only nostalgic readers and Popeye makes his cameo appearance in animated cartoons such as the Simpson next to famous actors, singers and politicians like Hillary Clinton. In 1992 I was majorly getting into North American independent comics, Los Bros Hernandez, Dan Clowes, Dennis Eichorn, Fiona Smyth, Mary Fleener, Roberta Gregory and many others were putting out great comics that I would snap up. If it was on Fantagraphics, Drawn & Quarterly or Vortex it would be in my bag when I left the shop. This all started around 1989 when I discovered a copy of Dan Clowes’ Lloyd Llewellyn Special in a box in a comics shop in Battersea. I had no idea what to make of it but quickly decided it was the best thing ever. Clowes jagged art and 1950s beatnik inspired detective was a revelation. Around the same time I was given a few copies of Peter Bagge’s Neat Stuff, again I was dazzled. It was like reading some warped profane version of Looney Tunes cartoons, but Studs Kirby, Girly Girl and The Bradleys became must reads. I was now a big fan of Bagge’s twisted world. Both Lloyd Llewellyn and Neat Stuff came to an end just as I discovered them, but Clowes’ and Bagge’s next comics, Eightball and Hate would make them ‘90s comics stars. 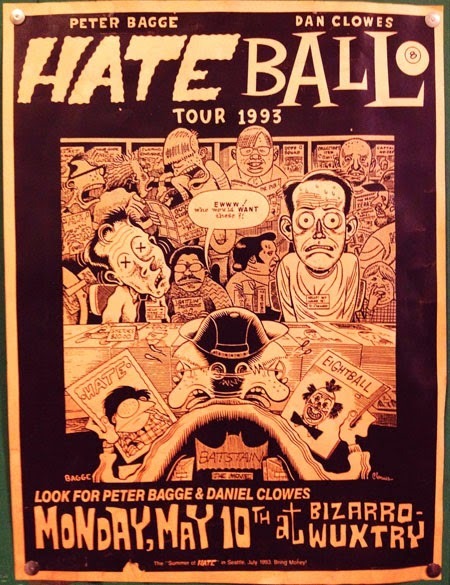 They even went on a promotional tour together in 1993, the Hateball tour, I wish I’d seen that! Up until then I had mainly been reading British comics, I read 2000AD as a teenager. Comics were still in the bubble caused by the successes of Watchmen, Maus and The Dark Knight Returns, but it was starting to deflate. Alan Moore’s Big Numbers had ground to a halt in 1990, and 2000AD’s publishers Fleetway had tried and failed to launch several new titles including Revolver and Crisis, both of which ended in 1991. One comic that seemed to be bucking the trend was Deadline, launched in 1988 by two 2000AD alumni Steve Dillon and Brett Ewins. The success of Deadline had been one of the inspirations behind the launch of Crisis. One of the great things about Deadline was that it tapped into the small press comics scene and helped to launch that talent to a wider audience. Jamie Hewlett and Alan Martin’s Tank Girl was huge news, and the very poor Hollywood film version was still a few years away. Although attracted by the ex-2000AD contributing editors and the punky attitude of Tank Girl, I quickly realised that there were many other gems to be found in Deadline’s pages. 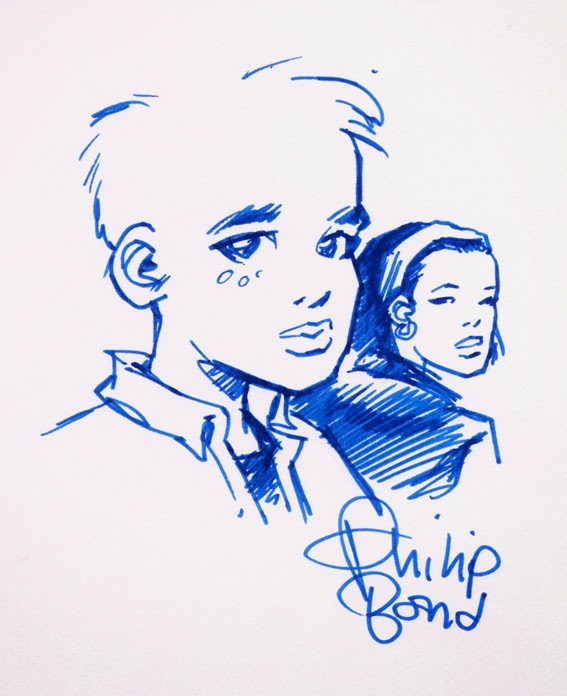 A favourite still is Hugo Tate by Nick Abadzis, and other strips I loved included Philip Bond’s Wired World and Timulo by D'Israeli D'Emon Draughtsman (Matt Brooker). I’d been reading Deadline since it launched but by 1992 my interest had waned in favour of these new American comics. Deadline must have seen the writing on the wall though as they began serialising Xaime Hernandez’ Love & Rockets story The Death of Speedy. In March 1992 my two comics worlds came together in the 3rd annual GlasCAC (Glasgow Comic Art Convention). Many of the Deadline crew were attending as part of a promotional Mini-Tour. But the bigger news for me was the appearance of Peter Bagge promoting Hate. 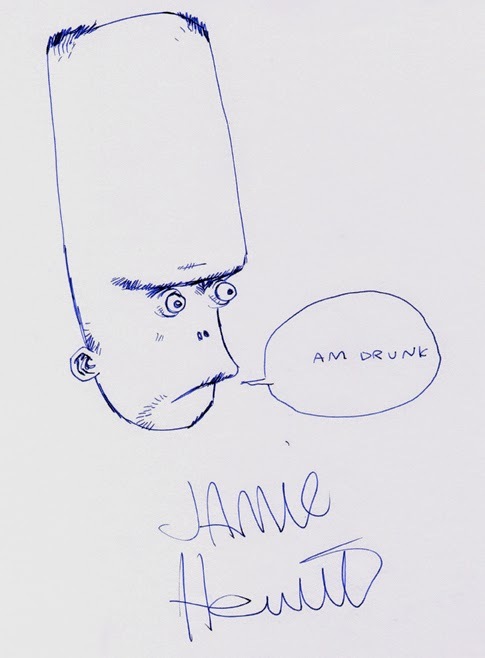 I don’t really remember meeting the Deadline folks but I did manage to get drawings by Philip Bond and Jamie Hewlett in my sketchbook. My main target though, was Bagge. I was pretty shy and the convention as a whole was a weird experience. It was mostly superhero creators that were there and I had no interest in them, so I felt a bit like an outsider at an outsiders’ convention. I found Peter sitting at a table in a quiet room but took a while to muster up the courage to talk to him, I was in awe. He was there with his wife Joanne and they were both the absolute sweetest folks. We chatted a little about comics and about how their trip was going and they put me at ease. I felt a bit weird asking for a sketch, asking an artist for free work always seems strange but it’s accepted at conventions apparently. Peter obliged though and drew me a quick sketch of Girly Girl. I don’t have the drawing today though, I immediately gave it to the friend who introduced me to Neat Stuff.